Welcome to Peace and Quiet! 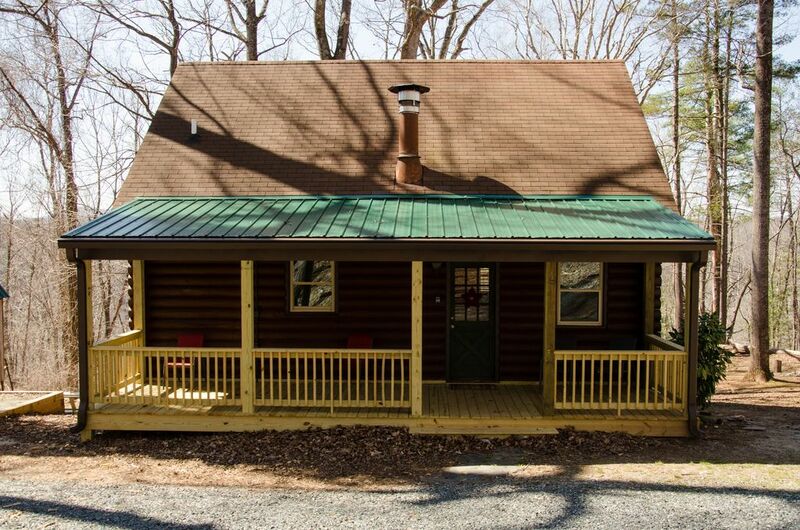 This secluded Renovated home is just 15 minutes to Downtown Lynchburg and is located in Historic Amherst County on the James River. The Water is just a short hike down the hill and you can fish on the bank, or launch a boat for more fishing, jet-skiing, or even water skiing on the River at the Monacan Park boat ramp about 3/4 Mile upstream and just a 4 minute drive away. The Blue Ridge Parkway, Appalachian Trail, National Forest Recreation Opportunities, Fishing, Antique Shops, Wineries, Breweries, and Fine local Flair restaurant are all within a short drive. Within 25 minutes are 6 Local Colleges including Liberty University, Randolph College, Lynchburg College and Sweetbriar College. The home boasts a Completely Remodeled Kitchen complete with Hickory Cabinetry, Stainless Steel Appliances, Gas Range, dishwasher, and side-by-side fridge with ice / water dispenser. There is seating for 6 at the Farm Table, The living area is open and the leather furniture is comfortable. This area accesses the full length covered back porch perfect for enjoying Nature in total seclusion. A gas grill is installed along with a porch swing and a number of comfortable chairs. There are 3 bedrooms including an open loft Master bedroom w/ Queen bed, & 1/2 bath. The Main Level Bedroom is Small, but includes a Full under Twin Bunk Bed and closet space. The M/L Full bathroom also features new tile and hickory vanity. The 3rd Bedroom is on the terrace level which also houses a full bathroom with patio access under the covered back porch. Amenities include Direct TV satellite service Hi-Def Flat Screen in living room, Blu-Ray and internet access via satellite service. New in 2015, a 10X10 deck on the River, A number of fish were caught here including a 10-LB Flathead catfish Summer 2016! Trail to river is somewhat steep, but worth the hike! The property is located on 7 acres of forest land that borders the James River. There is a wide variety of wildlife that calls our acreage home as well including deer, turkey, squirrels, turtles, lizards, snakes, bees, wasps, mice, and countless insects. We do our best to keep the wildlife out of the cabin, but be aware that there may be some that gets in during your stay. Karl and Alys Miller reside in Lynchburg along with their 2 children. When they are not serving the community through work or volunteering efforts, they enjoy creating Great Memories with their family in the Outdoors of South Central VA or a travel destination! The Entire family loves to Ski, and travel. Alys is a Master Naturalist and frequently volunteers at The Claytor Nature Center, Camp Kum-Bu-Yah, Dunbar Middle school and RS Payne Elementary. Karl is a Local Real Estate agent and enjoys helping his clients achieve their Home Ownership Dreams. His hobbies include Running local trail races, skiing, Mtn Biking, reading, and travel. This is the perfect getaway spot! Comfortable with a complete kitchen and fully furnished with cookware, linens and towels. Nice furniture and a bathroom is on every level! Property is so conveniently located to town if you have family, events, or attractions on your To Do list while in the area. Fine Local restaurants are just 15 minutes away in either Downtown Lynchburg, or in the town of Amherst about a 20 minute drive away. National Forests Recreational Opportunities are endless and this house is right in the foothills off RT 130. almost in the shadow of Tobacco Row Mtn. If you want to fish in the river, a short hike down the trail offers great fishing off the bank or dock. Another option is to bring your boat and launch free at the Monacan Park Ramp just a 4 minute drive away! There is room to park a trailer here too. This home is a bit Rustic, but very Comfortable. full length covered porches both on the front offer relaxing rocking chairs while the back porch has a porch swing and plenty of chairs that overlooks the trees and slope that showcases wintertime river views. A New gas Grill and New Gas range are easy to cook with. There is a fairly strong cell signal here and there is a 39' Hi-def TV complete with Dish-network service. Wi-FI Internet is also connected, on satellite service so it's suitable for email, social media, etc, but slow for gaming or streaming movies due to slower speed and limited data. Some guests Bring cell serviced 'hotspot' tablet or phone and Verizon has a fairly good signal here to stream with. This home is most suitable unplug, unwind, enjoy nature (deer frequently are seen daily here), and the River. property is on 7 acres. No other homes in sight. driveway shares to a seasonal neighbor located 200 yards away across a dry hollow. The James River fronts property 4 miles N. W. of Lynchburg. Approx. 2 miles upstream from Ruesens Dam, Water is deep & slow moving. Perfect for canoing, flat water kayaking & fishing or even jetski. Wintertime views of the River. over 300' of frontage with access down the trail on property. 300' of James River Frontage. The cabin sits above the river. Winter Views of River. A 2/10 mile trail leads to river. Deck on river is a great platform to soak up sun, enjoy nature, swim, or fish. Dining area is off the kitchen and is open to the Living space. Antique Farm table and 6 Chairs. 39" Flat Screen Hi- Def. The James River Float Company is located just a few miles downstream and offers tube / kayak/ canoe rental options. Or bring your own and put in at Monacan Park just upstream. This is truly a sweet getaway, Neighbors are out of sight and there is a trail down the hill to the river. it is a good hill down, but fishing options are right there on the bank for you. Monican Park is a beautiful recreational area about 3/4 mile upstream and a 4 minute drive away where you can launch a boat or canoe. Rustic Getaway. Currently there is NO internet or TV but decent cell phone service so a tablet or mobile wireless device should have service. Especially Verizon's signal is strong there. This is the 2nd year we have stayed in the cabin. It worked perfectly for 4 guys to hang out for a weekend. The beds are nice and comfortable. The linens are fresh and the entire place is clean. The outdoor firepit and wood was perfect for sitting around the fire and watching the sun fall. Very nice and clean cabin. Perfect for a weekend getaway. We love our stay, had all the necessary amenities that we need it. Everything was in working conditions and clean. Only recommendation is to put more gravel in the entrance of the cabin because with the rain and humidity sometimes was inevitable to get the shoes very dirty. Everything else is perfect. !!!! We had THE BEST time at the cabin over the weekend. The cabin was cozy but had more than enough room for all of us. We woke up to a heavy snowfall a little earlier than we expected, but it really made the weekend. We loved that we were set back far enough that we felt secluded, but we were only a 20 minute drive away from anything we needed. We definitely hope to come back in the future, we really had the best time. Thank you so much for sharing your space with us! Our friends and family enjoyed our stay at this quiet, secluded cabin. The kitchen had everything we needed, there were enough bedrooms to spread out, and the wood stove was really nice. Just what we were looking for quite, peaceful and relaxing. Wish we had more then just a weekend. We crammed a lot into a 2 day weekend. Morning coffee on the back porch and campfire at night. I would have loved to just stay at the cabin a day or 2 to do nothing but enjoy more quite. Glad you had a good time at the cabin! Thank you forntakingngreat care of of it. We love it as a family and spent last weekend there relaxing. While there we replaced the lightbulbs that we realized were burned out. Hope you come back in the future! Amherst County is a Wonderful area in S. Central VA with Mountians and the Blue Ridge Parkway just a short drive on either RT 130 West or 60 West. Revitalized and beautiful Downtown Lynchburg is just 4 miles downstream (about a 15 minute drive) away where plenty of restaurants, shops and newly Restored Academy Of fine Arts Theatre is located. MTN Biking, Canoing, Fishing, Hiking, horseback riding, antiquing, Brewery / Winery Tours, and many other destination opportunities abound. If we can help with any info or other questions, don't hesitate to ask! Our Cabin provides a well-supplied vacation home in a peaceful setting with a deck to fish or swim at on the river. Internet and TV is on site. All fees include linens and towels, use of firewood and all items in home.